After a 5-hour walk in the Garganta de los Infiernos Nature Reserve during our road trip to northern Extremadura it was time to head to our next destination: Hervás. 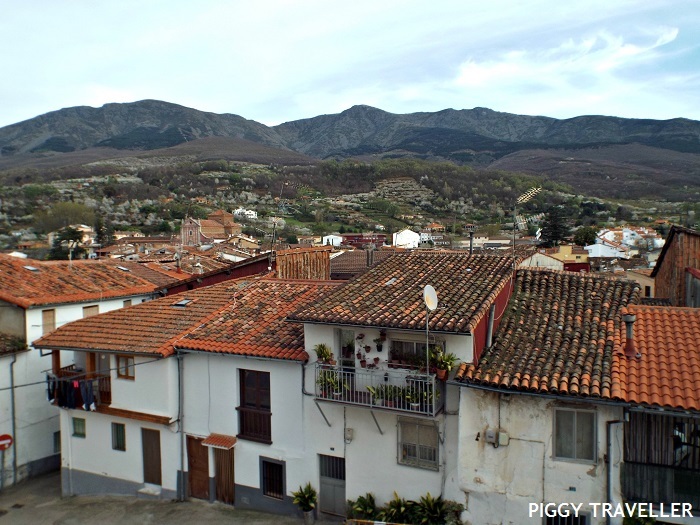 This small town is located in the Ambroz Valley and is famous for having one of the best-preserved Jewish quarters in Spain. 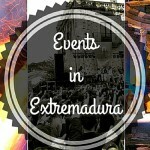 It had been on my Extremadura destinations list for ages and it was about time to visit it! The easy, but slightly longer way: take the road N-110 down to Plasencia and then drive up to Hervás on road E-803. The journey is 77 km and takes about an hour. 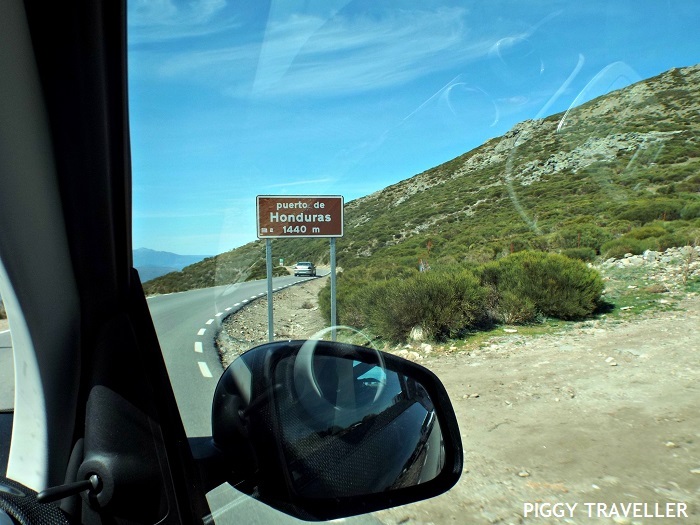 The dizzy, but worthy way: take the mountain road (CC-102) via the Honduras mountain pass. The journey is only 35 km and takes about 55 minutes. Guess which route we chose? The scenery route, of course. 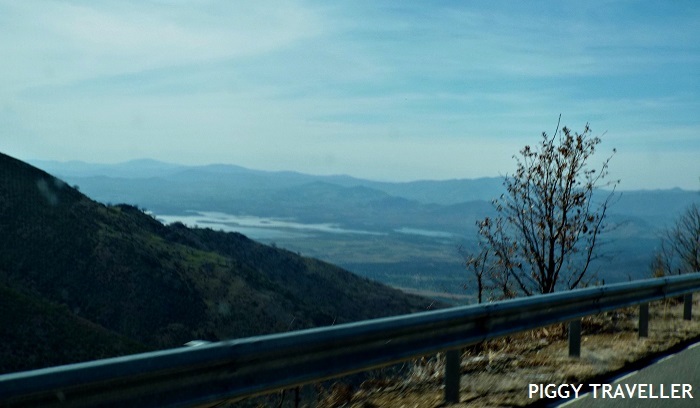 One of the best things of road trips is enjoying the roads and the views, don’t you think? This is a single track winding road not suitable if you suffer from vertigo or get easily carsick, but it is a real joy to be able to contemplate the valley at every turn of the road. Hervás dates from the 12th century, when monks of the Templar order built a chapel on the banks of River Santihervás. 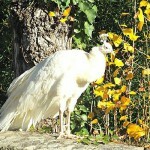 The monks were expelled a century later, a castle was built and families started settling down there little by little. 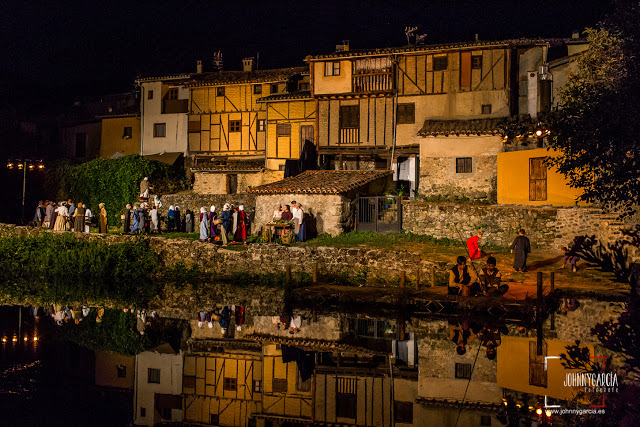 The Jews starting arriving in Hervás in the 15th century, escaping from the anti-Semitic environment in Castile. The Jewish community had been suffering the consequences of riots in several southern cities such as Cordoba and Seville. 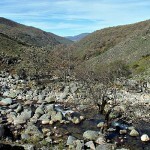 The riots spread to the north and some people escaped to Portugal; others decided to remain in the Ambroz Valley, right on the border with Portugal. In 1492 there were 45 Jewish families and a rabbi living in Hervás, who worked mainly as doctors, weavers, tax collectors and merchants. 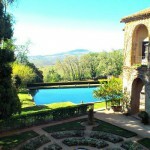 Some of them owned public buildings and vineyards in the best areas around town. In that year the Catholic monarchs Isabella and Ferdinand ordered the expulsion of all Jews residing in the kingdom. Before leaving they were allowed to sell their properties, in most cases for pitiful amounts of money or even in exchange for donkeys. A new law allowed Jews living in Portugal to return, as long as they had converted to Christianity. The number of people who returned to Hervás two years after leaving is unclear, although it’s known that the ones who did lived in and around plaza de la Corredera. The Inquisition persecuted and killed those who didn’t convert (and many who did). 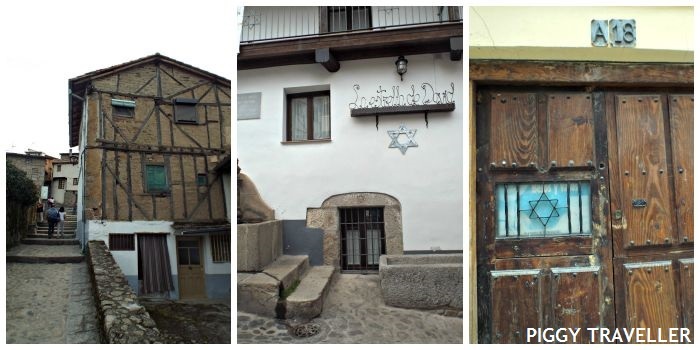 The Jews only lived in Hervás for about a century, but left an important trace in the town and their legacy remains today. Hervás’ Jewish quarter is one of the best preserved in Spain and was declared a Historic-Artistic Ensemble by the Spanish Ministry of Culture in 1969. Walking around the town centre is travelling back in time. 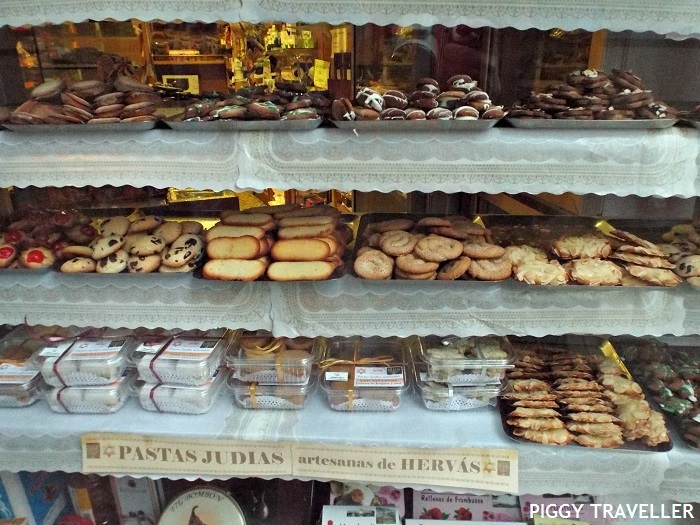 Hervás preserves its medieval feel in every street and every square. Stars of David are displayed on street signs in the Jewish quarter and on many houses. Its cobblestone streets are narrow and steep. The houses were built by the Jews using local materials, such as stone, adobe and chestnut tree wood. The front of houses show stone masonry in the ground floor and a structure made of chestnut tree wood and adobe on the first floor. 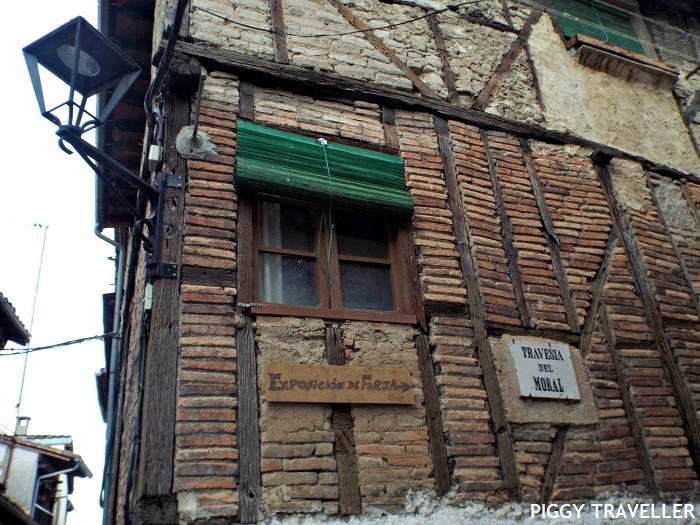 Traditional achitecture in ‘Travesía del moral’, Spain’s narrowest street. A singular feature of this construction style is the use of vertical roof tiles to protect the front of the houses from the rain. I think it’s a brilliant idea, bearing in mind the fragility of the other materials. Not only does Hervás preserve magnificent architecture in its Jewish quarter, but also traditional professions and trades. You’ll find quite a few signs announcing homemade wine, as well as little shops where to buy crafts. There is even a workshop that sells handmade baskets and a real Jewish bakery owned by an Israeli descendant of Sephardic Jews. Felt very tempted by what I saw, but the bakery was already closed! Subida al Cabildo. I was staying at a hotel located on the west part of town, so I arrived to the centre via calle Subida al Cabildo. It’s quite a steep street (the term subida means ‘ascent’) that leads to the highest point in Hervás. This is where the local castle was, as indicated by the remains of a fortress and walls that surround the later-built church of Santa María. Walk up the church and enjoy the views of the centre with cherry trees and mountains in the background. Calle Rabilero. This street is real proof of Hervás’s Jewish past. Between houses number 3 and 5 there is an alleyway that I imagine was very useful for people that was persecuted. Losing sight of someone you are following seems pretty easy around here. Many houses have the typical Jewish whitewash front and display lots of potted plants hanging from the windows and around the front door. Calle Sinagoga. Rabilero leads straight to Sinagoga, which preserves some stones of the original pavement and has good views to the church. Travesía del Moral. This is officially the narrowest street in Spain —barely 50cm in its narrowest part. Here you’ll see good examples of traditional architecture, although there is not much space to take great pictures! Calle de la Amistad judeocristiana. There is no other street in Hervás that better symbolises the coexistence of different cultures. In the early seventies Hervás held an event with different Jewish and Jewish-Christian communities that ended with the former calle del Hospital being called calle de la Amistad judeocristiana (‘the street of Friendship between Jews and Christians’). A plaque written in Hebrew commemorates the event. Calle Cuestecilla. The ‘Little slope’ street – at least there are steps – was the main entrance to the Jewish quarter. From left to right: calle Cuestecilla, calle de la Amistad judeocristiana and star of David in the front of a house. Calle de Abajo. Another great place to walk along and see beautiful front houses covered with the traditional roof tiles. By this time you’ll have realized it’s not easy to make horizontal pictures of a town with extremely narrow streets and alleyways. Practice your vertical photo taking! Calle del Vado. This street is almost semicircular and crosses River Ambroz on two places. 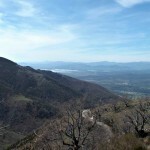 It leads to calle de Abajo on one end and to calle Sinagoga on the other end. Something that will likely catch your attention here and in the surrounding streets are little wooden doors in the front of some houses, which are part of a clever fire-fighting system. Here you will also see one of the most relevant public buildings from Jewish quarter, the Casa de la Cofradía. You can’t really miss it. If you are coming from calle de Abajo you’ll see it on the right. The front of the house corresponding to the ground floor is made of big stones painted white. The upper part shows the traditional structure made of chestnut tree wooden beams and adobe. This is where the Jewish community members met and attended assemblies. 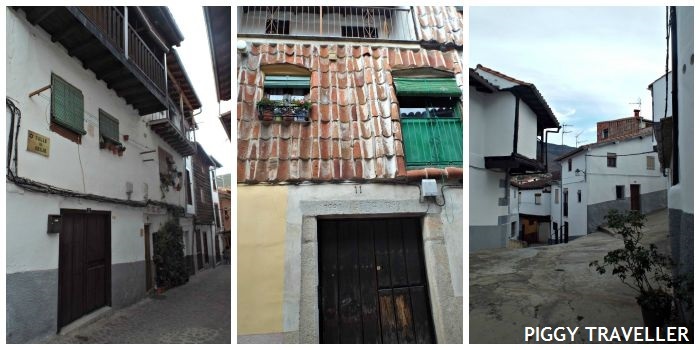 From left to right: calle de Abajo, traditional architecture in calle del Vado and whitewashed houses. Puente de la fuente Chiquita. Considered the oldest monument in Hervás, this one-arch bridge over River Ambroz is the perfect place to finish your walk in the evening before heading back to the centre for a nice meal in one of the local restaurants around plaza de la Corredera. Cross the river and look back for a nice view of the town. The riverside near this bridge is the scenery for a play taking place every year in July during a festival called Los Conversos (‘The converted’). Performance during ‘Los Conversos’ festival in the riverside, near Fuente Chiquita bridge. Plaza de la Corredera. 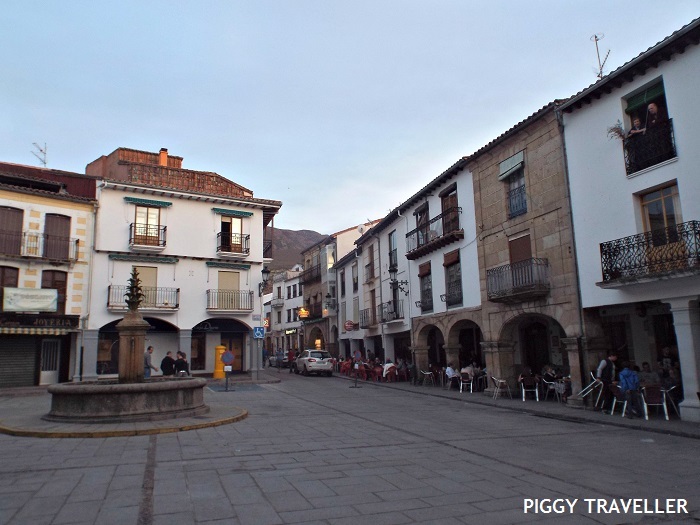 End your walking route at this charming square with several bars under an arcade and the classic northern Extremadura circular fountain in the middle. 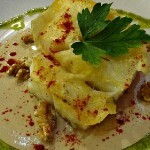 We finished our route with a lovely dinner at Restaurante La Parrilla. From Madrid: 241 km (route via Castile and Leon) or 294 km (route via Castile-La Mancha); from Cáceres: 113 km; from Plasencia: 39 km. Credits: thanks to Johnny García, local photographer, for the image.